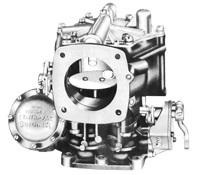 Holley concentric carburetors are sometimes referred to as 'Teapots' because they consist of a throttle body assembly with a float bowl suspended above. There are both 2 and 4 barrel models, and the basic type was used on cars from 1949 to 1956 and on trucks well after that. Governed models were used on IHC trucks into the early 1970's. 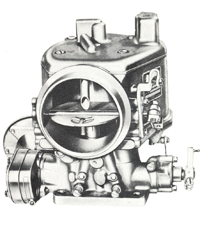 This Holley 885-FF and 885-FFC (auto choke) 2-barrel carburetor was used on 49-51 Mercury cars with the Mercury engine. The float bowl is concealed within the large airhorn housing. 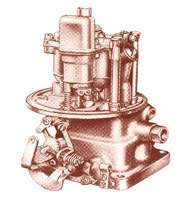 The Holley 885-FFG was a governed version used on 4 and 5 ton trucks. 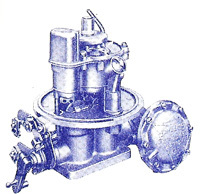 Later car models used the Holley 1901 carburetor in which the float bowl is exposed. The 1901-FFG was a governed version used on a variety of trucks, especially large Ford trucks in the mid 1950's. 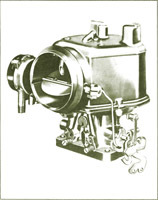 The Holley 2140 and Holley 4000 carburetors are both 4-barrel carburetors. The 2140 uses a mechanically actuated secondary, and the 4000 uses a vacuum operated diaphragm.